Back in 2011 Nike Golf introduced the VR Pro Combo irons, as part of its line of VR Pro irons which included three different models for three levels of play — the VR Pro Blades for better players, the VR Pro Combo Irons for low- to mid-handicappers and the VR Pro Cavity Irons for mid- to high-handicappers. Last August Nike Golf announced its new 2015 equipment line with much fanfare at a special event at Liberty National Golf Club, attended by NGN Alan and featuring none other than Tiger Woods, Rory McIlRoy and Jimmy Fallon. You can read Alan’s Vapor launch event recap posts here and here. The Vapor line of irons also features three different designs — the Vapor Pro irons for better players, the Vapor Pro Combo irons for low- to mid-handicappers and the Vapor Speed irons for mid- to high-handicappers. The Vapor line incorporates Nike’s Modern Muscle technology, which was revealed in its MMProto irons that were unveiled last summer (MMProto is short for Modern Muscle Prototype). The Pro Combo has been one of Nike Golf’s more popular iron designs, beginning with the original Pro Combo irons introduced in 2002, followed by the Pro Combo OS and Tour versions in 2003, and the VR Pro Combos that were released in 2011. The Vapor Pro Combos look to carry on the tradition, and continue the interest in one of Nike Golf’s most successful equipment offerings. Nike Golf sent me a set of the new 2015 Vapor Pro Combos to test and review — I’ve put the Vapor Pro Combos through their paces, and I share the results of my tests here. Out of the box you immediately see the Modern Muscle shape from the MMProto irons. The Vapor Pro Combos have a clean, modern look, with a classic player’s profile at address. They have a minimal offset, a bit more than the Vapor Pros but not as much as the Vapor Speed. The stock set is made up of 4-AW, with the 4-7 irons featuring a cavity back filled with Nike’s lightweight RZN material, similar to that used in the core of Nike’s RZN golf balls. The 8-AW feature a shallow muscle cavity and a more blade-like appearance. The back of the iron features the above-mentioned Modern Muscle design, which moves material to the heel and toe for increased perimeter weighting, stability and feel at impact. Nike says this also moves the CG from the heel side to the center of the face, which results in a higher launch angle — you can read more about that in their press release about the Vapor Pro Combo irons. The Vapor pattern on the back, along with the black muscle sections with Vapor logo, and debossed swoosh with Volt paint fill give the Pro Combos a distinct look. Custom tour stamping of initials is also available from Nike Golf via special order. The machined forged steel faces feature Nike’s X3X groove technology, which has also been incorporated into several of Nike’s previous iron models. The stock shafts are True Temper DG Pro, and the stock grips are Nike Tour Velvet by Golf Pride. All in all, the look of the Vapor Pro Combos is sleek and modern, while still retaining the appealing classic shape of a player’s iron. From my first swings I immediately noticed the stability of the forged head through impact. But the real beauty of these irons is their incredible feel, truly solid and butter soft when you strike the ball. The RZN insert in the rear cavity absorbs and dampens vibration, giving these irons a beautiful feel at impact. The increased perimeter weighting make these irons very stable and forgiving, while still giving good feedback when you strike the ball. I was really impressed by the quality of my mis-hit shots with these irons. Low handicappers will love the feel and control the Pro Combos provide, while mid-handicappers will appreciate their increased forgiveness. The Vapor Pro Combos promote a high ball flight that’s consistent from the long to the short irons, producing shots that fly high and land softly even with the long irons. They are very workable, I felt I had great control over the ball and was able to easily move it both ways. Distance control was also good, as they promote a consistent shot from club to club. Overall, the feel of these irons is truly exceptional, and the stability and forgiveness are outstanding. The Vapor Pro Combos feature a thin topline and classic iron profile at address. The toplines are slightly thicker than the Vapor Pros (which are blade-style irons), but thinner than the Vapor Speeds (which are game improvement irons). A slight offset (progressive through the set) gives a feeling of confidence, and you can’t see any of the RZN pocket cavity in the long irons or the muscle cavity in the short irons at address. These irons have the true look of a players iron when you’re over the ball. The Vapor Pro Combos are extremely workable, and it’s easy to shape the ball right or left throughout the set. The high ball flight allows you to land the ball softly from a variety of distances. I have good control of the ball with these irons, and with a solid downward strike I can spin the ball when I need to. The Vapor Pro Combo irons promote a high ball flight throughout the set. Whether I’m using a short, middle or long iron, I am able to consistently produce shots that fly high and land softly. Distance control was exceptional with the Vapor Pro Combos. I was able to rely on distance being consistent from shot to shot and from club to club. The high ball flight also added to distance control, as I was able to land the ball softly and consistently. I feel I can be very accurate with these irons, especially the short irons. I feel very confident when playing the Vapor Pro Combos, and confidence inspires performance. Whether I have a 5-iron or a pitching wedge in hand, I feel I can stop the ball close to the pin. These irons have terrific feel, very solid on shots that are struck near the center of the face. The RZN insert in the 4-7 irons really dampens vibration and absorbs impact, for a butter-soft feel when you strike the ball. The 8-AW have an especially pure feel, very smooth with great feedback on approach shots to the green. The Vapor Pro Combos combine feel and forgiveness for players of varying abilities, from the advanced player to the mid-handicapper. They produce a great shot from a solid strike while still giving a decent result from a less than ideal swing. The combination of the Modern Muscle design, the RZN insert, enhanced perimeter weighting and a beveled leading edge to prevent digging, all result in great forgiveness without sacrificing feel. The Vapor Pro Combo irons have solid acoustics, that great sound you expect from a player’s iron when the ball leaves the middle of the club face. The Vapor Pro Combo irons are another amazing iron design from Nike Golf. Nike’s new Modern Muscle technology is a new take on the muscle-back iron, contemporary in its design while still retaining a classic look at address. These irons have outstanding feel and give great feedback, and the introduction of RZN into the cavity of the 4-7 iron gives a boost in performance and forgiveness, which both better players and mid-handicappers will benefit from. If you’re looking for a new set of irons that have a great look at address, have tremendous feel at impact, and will give your mis-hits a pretty decent result (in both distance and direction), the Vapor Pro Combo irons may be just what you’re looking for. Have you tried the Vapor Pro Combos yet? If you have, let us know what you think in the comments below. Editor’s note: The product reviewed above was supplied by the manufacturer to the reviewer/author free of charge for reviewing purposes only. The reviewer/author was not paid for this review, and the opinions expressed in the review are strictly those of the reviewer/author. Back in September, I posted about some of my favorite golf bags that were going to come out in 2015 and since then I have received a number of inquiries about where to get the Vapor Air Hybrid Carry bag. Interested buyers can now get more information on the bag and order it from Discount Golf World. When I was at the Vapor irons launch in August I had tweeted that Rory and Tiger were wearing new Vapor hats that did not have the swoosh up front. These hats generated a lot of positive responses and they are now available on Nike.com in both the black version and the white version. Charl Schwartzel and other Nike staffers have already been seen on Tour wearing this hat. We’ve had official pics of the Vapor Pro Combo irons on NG Nation for a while now, but recently Nike Golf sent me a set to test and review. I’m posting first look pics (my first in-person look) here on the site so you can get a feel for what these beauties look like. These are really beautiful forged irons, with amazing design and craftsmanship. The set includes 4-AW, all featuring Nike’s new Modern Muscle technology. The 4-7 irons feature a pocket cavity with a RZN insert on the back, and the 8-AW utilize a shallower, sealed cavity on the back. All irons feature Nike’s X3X groove technology on the face, stock DG Pro shafts, Nike Tour Wrap grips and Volt color accents on the back of the head and on the grip. I’m looking forward to taking these to the range for a test drive, and then gaming them on the course to round out my testing. After that I’ll report back with my full product review, but until then enjoy the pics in the gallery below. And if you want to go ahead and get a set of your own, you can buy them here. If you want to see the spec sheet for the Vapor Pro Combos, you can view that here. New Modern Muscle design delivers ultimate blend of precision and power in a multi-material construction. Today Nike Golf revealed its new Vapor Pro Combo irons, part of the Vapor iron family, at an event in New York City. Developed at The Oven with Nike Golf athlete insights, Nike’s Vapor Pro Combo irons deliver the unique combination of more distance and control through innovative Modern Muscle design. Modern Muscle is defined by balanced weighting for perfected precision and power. As a collaborator throughout the development of these irons, Nike athlete Rory McIlroy used a prototype of the Vapor Pro Combo (MMPROTO 2i) to win the 2014 Open Championship. The new Modern Muscle design shifts the center of gravity, previously located closer to the heel, toward the center of the face. The long irons (2i-7i) feature a forged chassis with a thin, high strength machined face and a lightweight RZN insert to promote faster ball speeds, higher trajectory, and increased stability with pure feel. The short irons (8i-AW) feature a forged construction with a shallow cavity that promotes a strong, penetrating trajectory for enhanced shotmaking. For the first time, Nike Golf club engineers incorporated proprietary, lightweight RZN material – a modified version of the material found in the high energy core of Nike Golf’s line of RZN golf balls – in the cavity of the Vapor Pro Combo long irons, 2i through 7i. RZN technology displaces 45g of material to the perimeter of the club head while tuning impact feel. The result is enhanced speed, trajectory and forgiveness while maintaining workability and pure feel. The Vapor Pro Combo is constructed with progressive technology and geometry throughout the set, a concept first brought to market by Tom Stites with the original Nike Pro Combo in 2002. Precision-machined X3X grooves deliver spin control and shot-to-shot consistency, while progressive blade lengths and sole widths featuring a beveled leading edge allow for forgiveness and enhanced versatility. Slightly longer, lower profile long irons and classically-shaped short irons give the Vapor Pro Combo irons a modernized, updated look. The Vapor Pro Combo irons will be available on Nike.com and at select retailers October 31, 2014. Here are some additional photos I took. Sorry for the quality of pics but I still haven’t learned the intricacies of my DSLR and it was really dark out with a lot of spotlights. Early this week, Nike Golf unveiled its newest line of irons called Vapor. But this isn’t the first time that Nike Golf used the term in its product line. Here we take a look at some of the Vapor items and logos from the past. First up, we have the Nike Zoom Vapor golf shoes. If I recall correctly, these came out around 2010, and were the first Nike golf shoe that was focused on being lightweight. At 13.8 oz., and with an incredibly thin outer, the Nike Zoom Vapor was meant to be modern, sporty, and super streamlined. At the time, it was reportedly the lightest shoe on Tour. 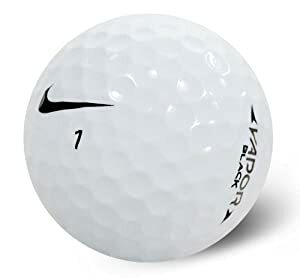 Nike first incorporated the Vapor name into its golf ball line with the Nike One – Vapor Speed balls, then broke them out to a separate ball called Vapor. There was Vapor Black and Vapor Black 2.0 – the ball line was short-lived, making way for the RZN line. The Vapor X bag is actually pretty recent. I got this bag about a year and a half ago. There was no distinct logo made for the Vapor X bag but it is written on the side of the bag. The Vapor X is the currently the top of the line stand bag. With the rebranding of its newest iron line to “Vapor”, Nike Golf follows in the tradition of other sports like Football, Lacrosse, Soccer and Tennis that use the term to represent their flagship lines. With that said, here are my favorite “Vapor” items from Nike’s extensive catalog that I would proudly support in a synergistic move to golf. I absolutely love this shirt because of how much it could be used to represent the new Vapor irons. I would wear this shirt to the gym, to the range, or just lounging around. When I play golf at private clubs I use a duffel bag to carry my shoes, an extra set of clothes, some balls, tees, and other items like my Covert wrench. Here’s a sweet Vapor bag that matches nicely with the irons. I would wear these as a golf shoe if they had spikes, as they have a similar look to the TW14. Love the fade accents like they had on the old Agassi’s. I Nike iD’d these in Vapor colors. I really like the simple and sleek look of these gloves. It would be great to see these made for golf. And when you just need to lug things in a backpack, here’s a great bag for the airport or for carrying your stuff to the golf course.